The following blog was written by Brittany Ballenstedt for the Paralyzed Veterans of America and can be found on their website. 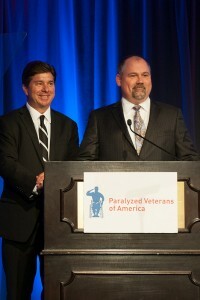 PVA is a partner in VA’s Adaptive Sports program providing new opportunities and experiences for paralyzed Veterans in communities across the nation. For John Peterson, volunteering time to serve our nation’s veterans has long been a family affair. It’s Peterson’s spirit of volunteerism – and the same spirit that’s evident in the more than 700 volunteers who devote their time to Paralyzed Veterans of America each year – that the organization recognizes during the 41st annual National Volunteer Week, which runs April 12-18, 2015. Peterson, who currently works in electronic data systems for Booz Allen Hamilton, began his volunteer service to veterans eight years ago, first at the Winter Sports Clinic in Snowmass Village, CO. He also volunteered time at Dulles Airport in Virginia to welcome World War II, Korea and Vietnam veterans participating in the Honor Flight program to see war memorials built in their honor in Washington, D.C.
From there, he began volunteering at the Wheelchair Games and became co-chair of the annual fundraising committee for the Mission: ABLE Awards, which honor individuals and organizations for their contributions to veterans with disabilities. 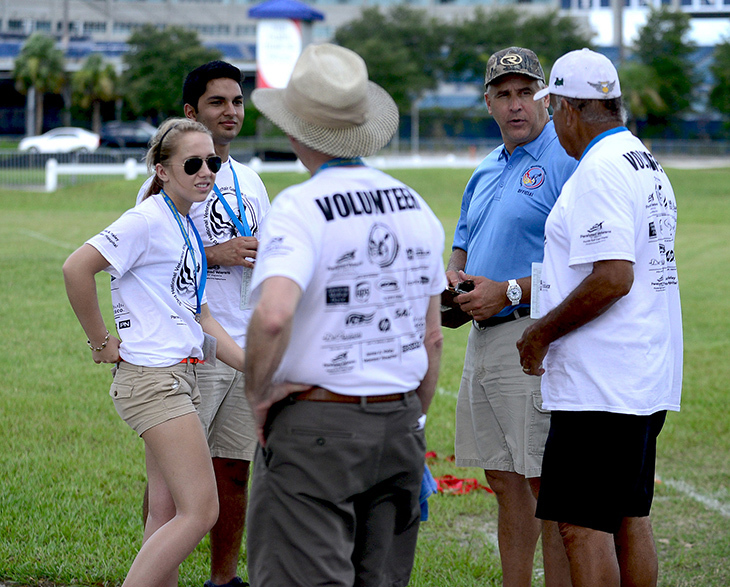 While Booz Allen Hamilton has long been an avid supporter of Paralyzed Veterans America, including serving as a gold sponsor at the National Veterans Wheelchair Games and conducting pro bono studies on veterans’ issues, Peterson’s spirit of volunteerism has brought the company and employees even more in line with the mission of supporting veterans. “Booz Allen Hamilton has been involved with Paralyzed Veterans of America for years, but the support of the Mission: ABLE Awards is something we’ve done more increasingly since I started,” Peterson says. Aside from giving back to the long history of military service in his family, Peterson’s goal has been to pay that appreciation forward to his own children. Peterson’s kids have developed that appreciation simply by watching their father’s giving spirit. For others who have not yet experienced the value of serving our nation’s veterans, particularly through Paralyzed Veterans of America, Peterson challenges all to get out and just do it once. Brittany Ballenstedt is a freelance journalist whose work has appeared in several publications, including Government Executive, National Journal, Technology Daily and NextGov.com.